One of my very favorite things to do when I travel is to take photos of beautiful buildings. Nine times out of ten I haven't the faintest idea of who designed them or even when they were built. Usually those details don't bother me in the least - I choose and photograph what appeals to me. 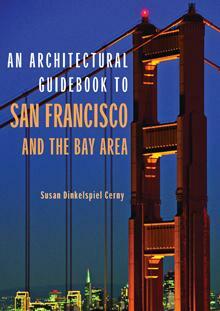 Now however, there is this fabulous guidebook/reference book to museums, parks, churches, theatres, civic buildings, adobes, and more, of the San Francisco and Bay Area. Compiled by a group of architectural historians, city planners, and architects, these people feature nine San Francisco counties, among which are Napa, San Mateo, Solano, and San Francisco itself. It's a comprehensive collection of information for anyone wishing to visit any or all of these areas. They've also included maps and wherever possible, the architects responsible have been listed, as well as the year the buildings were built. (1860s onwards) The maps have corresponding numbered dots to the lists of places, so when planning what to see, it's easy to work out a walking and/or driving tour of each particular area. There are more than 350 photographs which feature some truly amazing buildings. I wish the photos were in color but I completely understand the logistics; I do like the pictures anyway. For each area, a little historical information is provided before you go through the list of appropriate buildings. Conclusion - A broad spectrum of buildings and some very interesting reading.